1.) Wednesday, I stopped in Marshall’s flag shop and made some autumn flag purchases. There are many beautiful selections, and I had a difficult time deciding which one(s) I should bring home. This was one of my choices. 2,) That picture was taken yesterday morning during golden hour. And as I finished taking the photo, I heard a familiar sound: Antoine “snorting” hello to me. 3.) Recently, I was contacted by a web-site designer for a town on the Outer Banks of North Carolina, asking if he could use one of my photos on their web-site. I, of course, said yes and consider it quite an honor. I should give Motor Man credit for recognizing a photo op. He pointed this out to me during one of our trips to the beach and said that it would make a pretty picture. 4.) Birthday dinner this evening for a friend, and we’ll gather afterward at our house for dessert and birthday gifts. I’m pretty sure a good time will be had by all. 5.) Motor Man and I plan to attend an estate auction tomorrow; something a little different for us. Friends are going with us, and the weather is looking nice. I’ll share details next week. So, how about your week? Busy or quiet? Could you come up with five randoms? This entry was posted in Days at Home, Family, Sundae, The Swans, Traveling Days and tagged autumn flag, birthday dinner for a friend, estate auction, random five friday, white swan during golden hour. Bookmark the permalink. I’m sure I could come up with five randoms but they wouldn’t be as interesting as yours!! 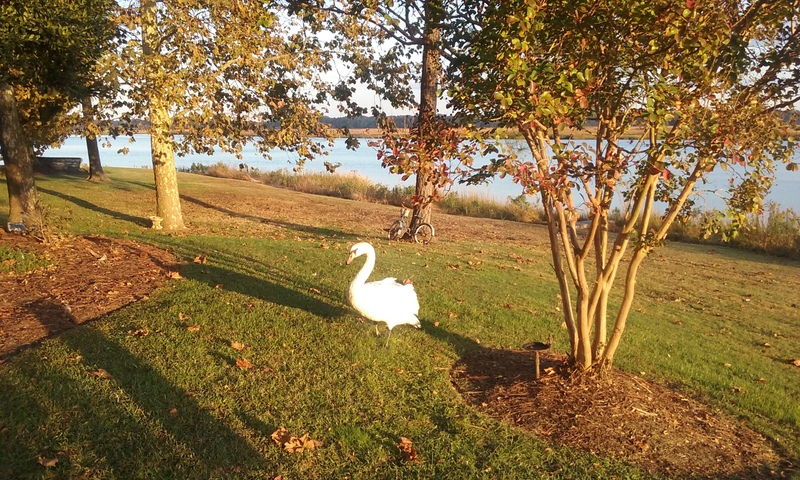 wonderful photographs and fun moments in your life especially love the beautiful scenery and the swans, well I lived on the water by Annapolis harbor and 5 swans would visit so often – seeing your sweet swans reminds me how extraordinary it is to make friends such as it is! with a swan 🙂 a very eventful week as my partner’s little company of 15 years is shutting down asap and I’m off finding new clients and / or a job whichever comes first! Lucky I have some fun and inspiring bloggers to pop by and visit and knitting and stitching and little dog & cat! Whenever you are able to post D – I always enjoy it hope you know you are appreciated! Good fall morning to you! I can see signs of fall in your pictures…love the picture with the swan ( which is rapidly taking over) he is so cute lyrics dominant. Love the flag and what a compliment on your picture being used, but I am surprised your phone doesn’t ring off the hook with requests! Can’t wait to hear about your auction and I KNOW you will have a good Friday night with friends. Enjoy your weekend and thanks for a week of Blog sharing! It has been totally uneventful in my bit of country and for that I am thankful… 😀 Hope Antoine approves of your selection of flags! 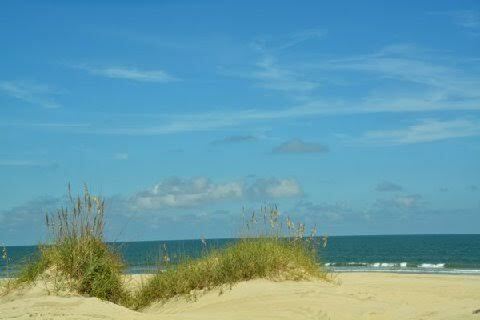 Oh my, the Outer Banks photo is fantastic, Dianne! No wonder they wanted to use it on their website. Not much here, just working on my revisions. Have a great weekend! CONGRATS again! So glad to see that others recognize how awesome your photography is – we already get to appreciate it. So proud for you. My random thoughts all point to relief that it’s FINALLY Friday – what a week!!! Will enjoy the weekend! The flag looks great ! – & so does Antoine – both at golden hour …. & I’m looking forward to dinner tonight- and dessert ! Congrats on another picture used to spread your beautiful photo ops. Having lived in the Tidewater area 15 years I always look forward to your updates. That flag is fantastic … does Marshall have a website for his flag shop? If so, I would like to check it out, thanks. Congrats on them using the picture, just lovely. 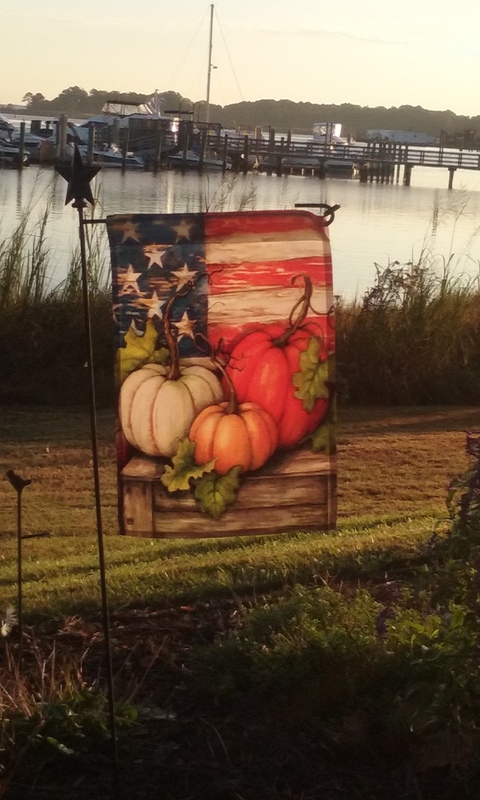 I love yard flags, I have purchased some of mine from the flag store also. Marshall and Bill have great selections. Love that store!! Hope you have a good time at the auction. Chuck and I went to our first auction last month. We loved it and will go back again!! Our week was fun, we spend a few days in the Blue Ridge Mountains. Beautiful fall colors!!!! Congrats on the picture!!! how exciting! Congrats on the photo request! And for a quiet week, seems you still found fascinating things (as always). I love the swan visits and your flag is beautiful. Your photography gets around! Congrats! Antoine has been quite the buddy this year. He must have overheard Bride & Groom swan talking about your place and stole their map!